It’s Arthritis Awareness Month! This month I am challenging you to take a little time each day and practice better self-care. Each day in May, I plan to share one simple way you can show yourself some love and appreciation. Save Spoons. Christine Mierandino elegantly gave the chronic illness community a way to explain our energy levels. Basically, we are given a certain number of spoons or energy each day. 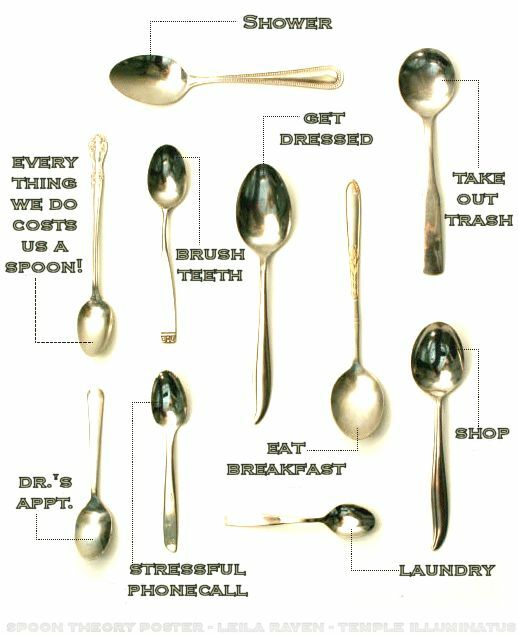 When you live your life with a health condition, you must make choices about how you plan to use those spoons. Many days, just waking up and getting out of bed consumes a spoon or two. As the day continues, you have to make choices of how you want to divide up those spoons because there is a limit. Today, save some spoons just for yourself. It has to be a conscious decision because they go quickly and you can’t get them back. Also, remember it is okay to end the day with a spoon or two unused. Recently, I saw a neighbor walking on the other side of the street with just one of her two dogs. Just as I was about to inquire about the missing dog, I stopped myself. I reminded myself that I am a person who soaks up other’s feelings and that day my spoons were almost gone. While I felt sad letting the conversation go because I know her dog is old and has been sick, I knew it was better to save it for another day. I needed the spoons I had left for other things that day. Was that selfish of me? Inconsiderate? No. It was me counting my spoons and acknowledging I have limits. Self-Care with a Chronic Illness: Say "Hi"
At our house we were also running out of spoons. For years we two never had enough spoons. We even started buying plastic spoons. Forks were fine, knifes were fine, but spoons we could not keep. Recently Sheryl was looking int he cabinets and she found an unused wedding gift. Now this was 40 years and 7 moves ago. But in the cabinet was a second set of silverware. We were amazed but there they were. Moral of the story, sometimes even if your spoons are limited, you can sometimes find spares in the oddest places.